The European Society for Paediatric Gastroenterology, Hepatology and Nutrition (ESPGHAN) holds an annual meeting to educate members and grow the specialist community. ESPGHAN appointed MCI UK as its PCO in 2009, and the agency used meeting analysis and feedback generated from the evaluation process in place at the 2010 meeting to help identify areas where delegates expected to see improvement. 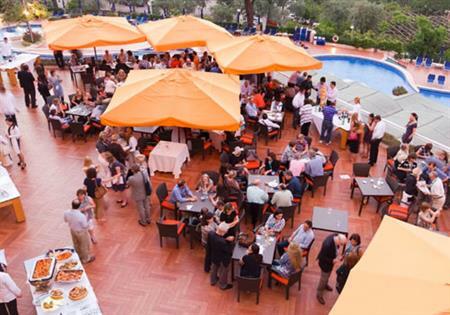 "Delegate numbers for the annual meeting have increased significantly in recent years, but the organisation was committed to working at the Hilton Sorrento Palace, which had been contracted based on delegate numbers prior to 2009," explains MCI UK managing director Jennifer Jenkins. "Ensuring there was sufficient meeting space at the conference centre in Sorrento, along with contracting enough bedrooms and solving transportation links for all delegates became a challenge. On top of that, a strike in Sorrento led to roadblocks and infrastructure issues during delegate arrivals, and continued throughout the first day of the four-day meeting," she adds. MCI UK worked with the congress hotel to identify extra space that could be used. Temporary rooms were built in the hotel's dining hall to create two fully soundproofed rooms with full AV, each catering for 350 delegates. To accommodate posters for display, a complex structure was erected over the hotel's tennis courts. Additionally, live feeds to all rooms were installed to ensure that all delegates were able to access the scientific programme. Exhibition space was limited, so sponsorship alternatives had to be sought to ensure that ESPGHAN continued to show its support for industry partners. The meeting boasted a diverse scientific programme, which included up to eight parallel sessions running at any one time and a full programme of satellite symposiums. The social programme included a welcome reception, opening and closing ceremonies, and a farewell gala dinner. Since MCI UK was appointed in 2009 attendance at the ESPGHAN congress has grown from 1,400 delegates to 3,300 in 2011. MCI UK devised an evaluation system that ensured all feedback - including that provided for the destination and the scientific programme - was captured. The agency also developed a sponsorand exhibitor-specific evaluation to allow ESPGHAN to build and develop relationships with key industry partners. "Profits, as well as delegate numbers, have continued to grow owing to the processes and procedures MCI UK have put in place and the rise in prestige and visibility that we have seen," says ESPGHAN president Professor Riccardo Troncone. The event won Association Congress of the Year at the inaugural C&IT Awards.